The EEC WASTE-SEP is an industrial membrane separator for a wide variety of chemically or mechanically emulsified solutions. EEC has combined advanced technology with proven concepts in efficient oil and water separation techniques. The result is a skid-mounted, fully automatic, liquid separator that can condition a milky, emulsified solution of oil, chemicals, ink, cutting oil and diesel fuel back to its origin. The EEC WASTE-SEP will, in most cases, restore liquid to its original quality, and water can safely be drained into the local sewer line or be reused. Military Supplier – Total Solutions EEC delivers compact Biological Wastewater Plant & Reverse Osmosis Systems to the Military. Complete solutions where RO solutions provide the everyday need for fresh water, while the EEC High-Speed Bio Tec WWTP treats wastewater into acceptable environmental standards. 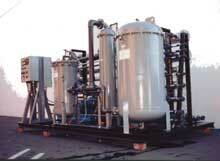 Systems can be shipped in containers or regular skid mounted systems. EEC package plants operate trouble free and are fully automatic.